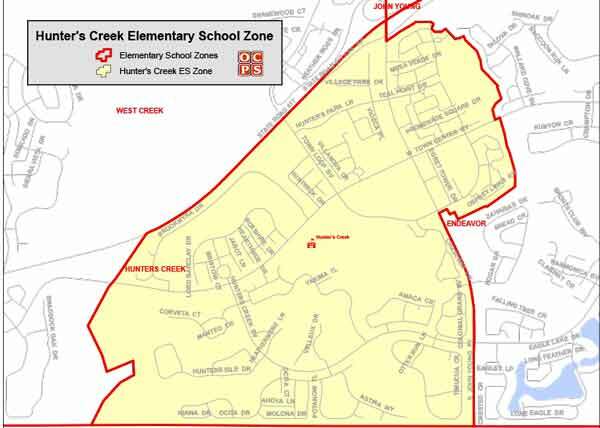 Searching for a home within the Hunter's Creek Elementary School Zone? Then you are in the right place! We work hard to make your next home search easy and efficient, so that when you are ready to buy or sell, we are ready to help! Hunter’s Creek Elementary School opened August 15, 1994. It is located in a rapidly growing community, and draws its population from the Hunter’s Creek community. The school serves Kindergarten – 5th grade. The many countries currently represented on campus represent a microcosm of the world with its wide variety of cultures. To serve this diverse student body, approximately fifty teachers and thirty staff members work together to make Hunter’s Creek Elementary a safe learning environment. The school offers a wide range of academic programs as well as the following support programs: English for Speakers of Other Languages (ESOL), Specific Learning Disabilities (SLD), Dual Language Enrichment (DLE) Program, Guidance Programs, Enrichment, Mentoring, Advising, Guiding and Instructing Children (MAGIC), Primary Varying Exceptionalities, Occupational Therapy, Physical Therapy, Adaptive Physical Education, Language Arts Resource, Strings Programs, academic enrichment for Extended Day, and Speech/Language to meet the needs of all students in our unique community. Hunter’s Creek Elementary is fortunate to have strong parental and community involvement. Parent involvement is encouraged through activities and programs such as Meet the Teacher, Open House, Conference Night, ADDitions, PTA, SAC, Literacy Night, Science/STEM Night, Multicultural Fair, PAWS Publishing, parent workshops, and student performances. The success of Hunter’s Creek Elementary can be attributed to the cooperative efforts made by students, staff, parents, and community all working together. Our community service involvement earned us state recognition as a “Five Star School,” and our instructional program and student achievement earned a grade of “A” from the Florida Department of Education. After School Programs: Spanish, Chess, Golf, Yoga, Guitar, Violin, and Art.